Instagram-worthy cocktails with an adventurous culinary bent is her M.O. I have to remind myself to trust bartender Gabriella Mlynarczyk. When perusing her new menu for Chef David Kuo’s Accomplice, a bar program she took over from Aaron Siak (formerly of Philadelphia’s The Franklin Bar) and Sam Houston (formerly of San Francisco’s Saison) last month, the flavors for her classic cocktail variations were, frankly, baffling. Her “Margarita” mixes pineapple, falernum, Blue Majik and tequila. Her “Mojito” combines the traditional rum and mint with bitter melon and chartreuse. The cocktail names are recognizable, but the accompanying mix of flavors, which were supposedly inspired by Taiwanese ingredients, aren’t so much. People who order these thinking they’d get a mild variation on these classics will surely feel mislead, right? But then after the first tentative sips of these photogenic cocktails, everything comes together. These aren’t merely translated classics but outside-the-box interpretations. Her Tiki-inspired margarita still carries the tequila forward but adds Blue Majik spirulina for both the color of the ocean and funk with li-hing (a salty Taiwanese dried plum) to incorporate a sweet-salty element. 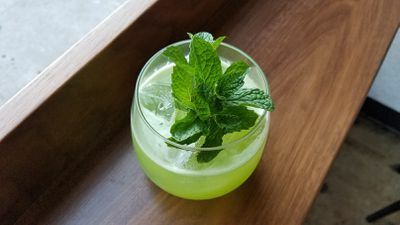 While the melon-y Mojito uses Taiwanese staple bitter melon for the cocktail’s bitter element, Midori for sweetness, and chartreuse for spice on the finish. “It’s like an herbaceous version of a Mojito,” she says. This is Mlynarczyk’s M.O. 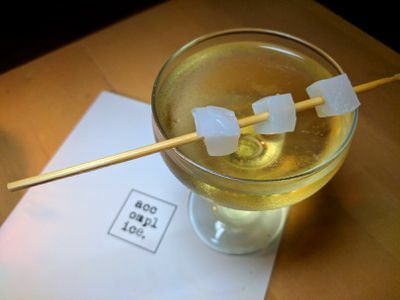 : creating restaurant cocktails that can stand up to the food in the intrigue department. “I wanted to open it up to people that would come into Little Fatty [next door to Accomplice] for a snack and then see that we have a pretty, cool cocktail list, too,” she says. Since moving to Los Angeles from New York six years ago, the British expat has run the bar programs at some of the best restaurants in the city, working with chefs like Mark Gold, Michael Voltaggio and Brendan Collins. In some cases Mlynarczyk, who has so many ideas that she has to blog about it, had gotten push back about going way out there with her cocktails. At ink, Chef Voltaggio was initially supportive but wanted cocktails that were approachable, unpretentious and befitting his brand. “Sometimes he would rein me in and say, ‘That’s a bit too crazy.’ I think sometimes he would worry that the bar program would get more attention than the food program by being too forward-thinking and artistic,” she says. “I was always trying to do something that would complement what he was doing in the kitchen.” Still she was able to incorporate fun touches like Campari fairy dust for her ink Negroni. Chef Collins, on the other hand, has been more open to her style, simply asking for her to keep the cocktails affordable and unique to Birch. “For the most part they’ve all given me a lot of support on the drink program,” she says of the chefs. Since an affordable program is always a big concern, rather than plucking ingredients from the farmers market, Gaby rifles through the readily stocked kitchen pantry. Her creativity transforms that oft-overlooked source into a gold mine of inspiration. From there she finds the means to create brown rice orgeats, candied toasted sesame garnishes, and even a vegan egg white alternative. Mylnarczyk continues to work at Birch while fine-tuning her new cocktails at Accomplice. The only “vacation” she’s taking is Vacation, a new bar in Santa Ana’s Arts District she’s consulting on which is slated to open in the spring. I first met Gaby when she was at ink and since then have followed her through her different projects, including her brief stints at Freddy Smalls and the now-closed Cadet. I’ve been consistently impressed by how she’s been able to create cocktails that not only complement food but stand out on their own, too. Something that almost no one in the city can do. 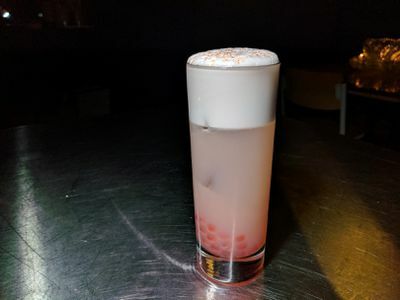 Ramos Fizz: Gin, strawberry, rose liqueur, coconut LaCroix, pink peppercorn, bursting boba. “How Bartender Gabriella Mlynarczyk Reinvents the Restaurant Cocktail.” Eater LA – All. http://la.eater.com/2017/3/8/14845064/bartender-gabriella-mlynarczyk-reinvents-restaurant-bar-cocktail.